The winners of the 8th Annual Irish Film & Television Awards were announced at a gala ceremony held at Dublin’s Convention Centre on Saturday, February 12th. Gritty feature, ‘As If I Am Not There’ scooped three awards on the night in the categories of Film, Director and Script for the film’s debut writer/director Juanita Wilson. In television drama, the fourth and final series of ‘The Tudors’ was named Best Drama Series / Soap which followed awards for the series’ craft team in Costume Design (Joan Bergin) and Make-Up and Hair. Live Aid biopic, ‘When Harvey Met Bob’ received the IFTA for Single Drama/ Drama Serial whilst its star Domhnall Gleeson was announced the winner of the Rising Star Award and Lead Actor Television. Well-known faces featured amongst the winners of the acting categories alongside a host of young Irish newcomers. Receiving his first IFTA Awards, Martin McCann was named the winner in the Lead Actor Film category for his performance in Zanzibar Films’ ‘Swansong – Story of Occi Byrne’, whilst ‘Rewind’ actress Amy Hubeman received the Lead Actress IFTA. Pierce Brosnan and Saoirse Ronan won acting awards for their Supporting roles in the international features ‘The Ghost’ and ‘The Way Back’ respectively. Finally Stephen Rea and Ruth McCabe received IFTAs for their performances in the television drama ‘Single Handed’. Cinematographer PJ Dillon and production designer Ray Ball won Awards for their work on Ian Power’s ‘The Runway’, with television drama ‘The Silence’ winning IFTAs for its director Dearbhla Walsh and series’ sound team. ‘Love/Hate’ writer Stuart Carolan received the IFTA for Writer Television with ‘Na Cloigne’s Ray Harman winning the composing award. Editor Emer Reynolds won her third career IFTA Award for her work on the feature film ‘My Brothers’. Factual category winners on the night included Spotlight’s ‘The Iris Robinson Investigation’ for Current Affairs with ‘Freefall: The Night the Banks Failed’ and ‘Voices From the Grave’ winning the Documentary and Documentary Series awards respectively. ‘Operation Transformation’ received the IFTA for Factual programme and ‘The Pipe’ won the George Morrison Feature Documentary Award. 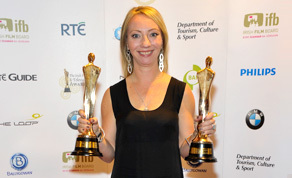 As to television genre categories Entertainment series ‘Your Bad Self’, Sports documentary ‘In Sunshine or in Shadow’ and children’s/youth series ‘Big City Park’ received honours at IFTA 2011. The Philips Short Film Award was won by ‘Small Change’ with ‘1916 Seachtar na Cásca’ winning the IFTA for Special Irish Language. Finally, the IFTA for Animation was awarded to David O’Reilly’s ‘The External World’. In the international categories David Fincher’s ‘The Social Network’ won the IFTA for International Film with its star Jesse Eisenberg winning for International Actor. Annette Bening received the International Actress award for her performance in ‘The Kids Are All Right’. Other highlights of the evening saw producer Morgan O’Sullivan (The Tudors, Camelot, PS I Love You, Braveheart) receive the Outstanding Contribution to Industry award. Actresses Joely Richardson, Kim Cattrall and singer Joss Stone joined the celebrations in Dublin to pay tribute to Morgan’s career in the Irish film and television industry. On a final note, the RTÉ Guide Best TV Moment of 2010 was also revealed at the IFTA ceremony, The Republic of Telly’s premiere of The Rubber Bandits’ ‘Horse Oustide’ was voted the winner in this People’s Choice category. Broadcasting live on Irish television, 37 IFTA Awards were announced in categories across feature film and television.